Sunday, November 16th: Local Hazelnuts, Holiday Hams, Sweet Squash, Perfect Pears, Soul-Warming Teas & More! It’s been c-c-c-c-c-o-l-d-d-d-d this past week, and that means we may be missing some crops today. But hey, it could be worse. We could live in Fargo, where you needed a jackhammer to harvest potatoes this week. Guess what else? There are just 11 days left until Thanksgiving! Have you gotten your turkey or ham yet? If not, better snap to it. You can still arrange for hams from Olsen Farms or Skagit River Ranch, and Growing Things Farm still has a few turkeys left, but you need to buy or reserve them today for delivery next Sunday! Hazelnuts from Holmquist Hazelnut Orchards at Ballard Farmers Market. Copyright Zachary D. Lyons. This time of year, I am just nuts for nuts. Aren’t you? And lucky for us, Washington’s own Holmquist Hazelnut Orchards is returning today to your Ballard Farmers Markets after several years’ absence! Up in Whatcom County, they grown some of the finest hazelnuts you will ever taste anywhere. They are big, fresh and sweet. They have them raw, roasted, seasoned in a wide variety of flavors, and they even offer some absolutely fabulous hazelnut oil, great for finishing soups, salads and other dishes. Beautiful carnival winter squash from Growing Things Farm at Ballard Farmers Market. Copyright Zachary D. Lyons. Growing Things Farm also has lots of gorgeous winter squash and pumpkins right now. Choose from a couple of varieties of kabocha squash, sweet dumpling squash, red kuri squash, Jarradhale pumpkins, or these beautiful carnival squash. Crispy pears from Collins Family Orchards at Ballard Farmers Market. Copyright Zachary D. Lyons. These are crispy pears from Collins Family Orchards. Honestly, I don’t remember seeing them in previous years. So I did what any farmers market blogger worth his salt would do… because I care about you. I got one, and I ate it. (It’s a dirty job, but someone has to do it!) 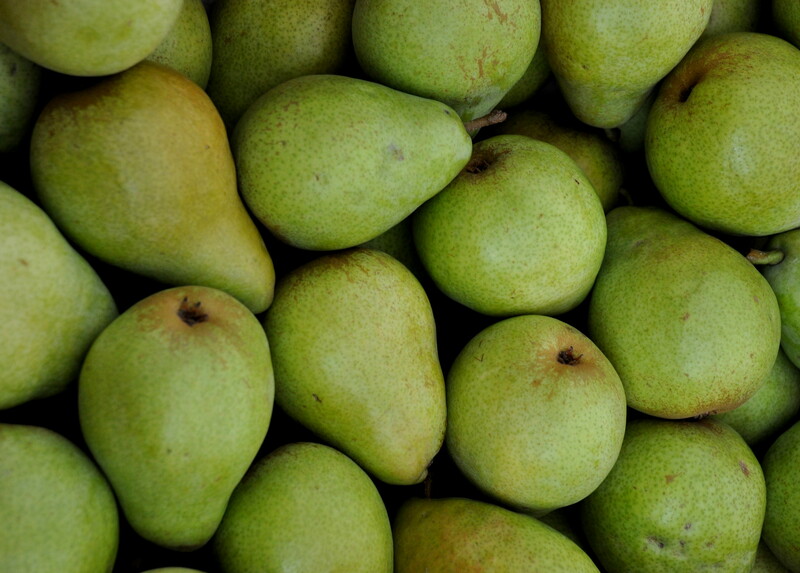 These cute little pears are quite juicy and not overbearingly sweet. I quite enjoyed mine. I think you’ll enjoy these, too! Fresh Keta Ikura from Loki Fish at Ballard Farmers Market. Copyright Zachary D. Lyons. This past Thursday may have marked the last day in the 2014 Puget Sound Keta salmon fishing season, so today may be your last day to enjoy fresh Keta salmon from Loki Fish. They actually catch this keta in the center of Puget Sound, straight out from Magnolia Bluff. And besides the versatile fillets Loki offers, they also take Keta roe (eggs) and cure them with salt to make ikura. This local delicacy is great for the holidays. I love it on some Tall Grass Bakery baguette with some truffled fromage from Mt. Townsend Creamery. Herbal teas from Harbor Herbalist at Ballard Farmers Market. Copyright Ben Chandler. Cold nights and approaching holidays call for tea. Why not try some local herbal teas from Harbor Herbalist this fall? They are blended with many ingredients grown on Vashon Island and other local farms, and they come in a terrific selection of delicious blends. Some will relax you. Some will wake you. Some with help cure what ails you. And some will even put you in the mood. Now, that’s a tea that will warm you up, people! And it makes a great stocking stuffer, too! Kale, zucchini & collard chips from House of the Sun at Ballard Farmers Market. Copyright Zachary D. Lyons. There are only two more Sundays for House of the Sun Raw & Vegan Foods at your Ballard Farmers Market. Adam is retiring his business and moving on to other adventures. So stop by now for all the kale chips you can carry to your car! And give the big lug a hug and a thank you, while you’re at it! Serrano chile peppers from Stoney Plains Organic Farm at Ballard Farmers Market. Copyright Zachary D. Lyons. Peppers are pretty much done for this year. Pretty much, I say, save for the fact that Stoney Plains Organic Farm harvested a LOT of them before the cold set it, and today, they’ll have some left just for you at your Ballard Farmers Market! They should still have jalapenos, poblanos and some of these lovely serrano peppers. These… and red sunchokes, too! Decorative gourds from Boistfort Valley Farm at Ballard Farmers Market. Copyright Zachary D. Lyons. We finish our weekend installment this week with these pretty ornamental gourds from Boistfort Valley Farm. They are perfect for sprucing up your home for fall. Boistfort also has plenty of the edible gourds, too — winter squash and pumpkins, as well as garlic, honey, rutabagas, parsnips and lots of other fall localiciousness! Don’t forget to check out this week’s midweek blog post for more information on what you’ll find today at you Ballard Farmers Market. And there is plenty more local deliciousness waiting for you today at your Ballard Farmers Market. Just check What’s Fresh Now! for a more complete accounting of what is in season right now.